Last updated by Shari Harley at April 7, 2019 . Negative Feedback – Can They Handle It? Last week I was talking with a friend who works for a large investment bank. He said, “I don’t believe in the premise of your book. 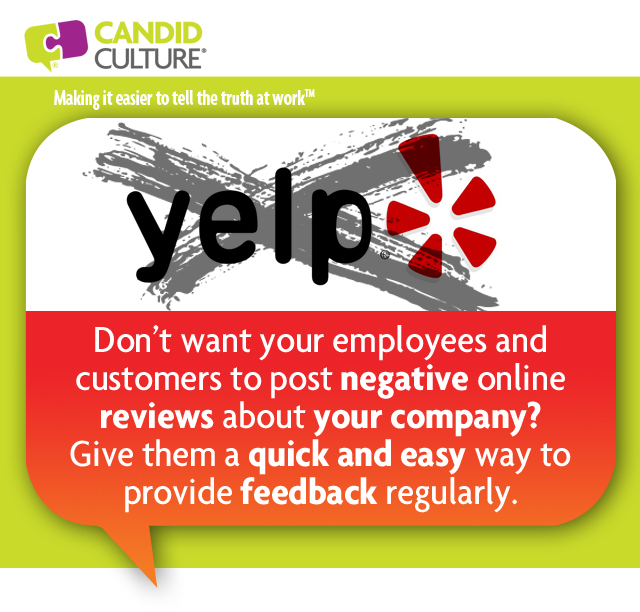 There is no place for negative feedback in the workplace. It’s just not possible.” And I’m seeing firsthand how hard it is for people to receive negative feedback. All kinds of people – sensitive people and less sensitive people, Type A and laid back types. No one wants to hear she made a mistake, could have done something better, or any other type of negative feedback. It’s just too hard. This is a massive conflict for me. At Candid Culture, we teach people how to give and receive feedback and yet, here I am wondering if it’s even possible. We need to be able to tell people what they can do better. And the truth, is, while people may not want to hear negative feedback, most people do want to know what they can do to improve their performance and get ahead, hence the quandary. Give negative feedback and evoke others’ defensiveness or say nothing and put up with whatever isn’t working? I, of course, would prefer that you give the feedback, believing that it empowers people to make better personal and professional choices. The question is how? Assess candidate’s openness to feedback when you interview, and don’t hire people who don’t accept negative feedback. 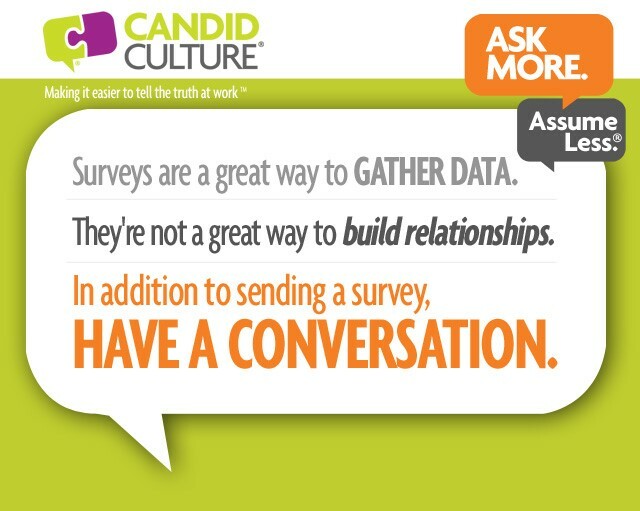 We do practical interviews at Candid Culture. We give candidates a chance to do some of the work they’ll be doing on the job and tell candidates what they can do to improve, during the interview. Then we see how they accept our feedback. We also ask interview questions that help elucidate whether or not candidates are open to feedback and we ask candidates’ references how well the person accepts negative feedback. Observe performance regularly and provide balanced feedback from the start. Don’t wait until a problem occurs or until you have time to give feedback. Begin the practice of meeting weekly to review and discuss work, setting the precedent that this is the way you do business. Provide positive feedback regularly so people know the good stuff and aren’t solely focused on the negative feedback they receive. Ask for and be open to feedback. When you demonstrate being open to feedback, you earn the right to give feedback. Lastly, don’t underestimate how hard it is to hear negative feedback. When some people receive negative feedback, they begin to question themselves, their skills, and their value. So tread lightly. Pick your battles. Address only what you really need to and say things gingerly, remembering that you’re talking to a sensitive person, no matter how tough he may seem. 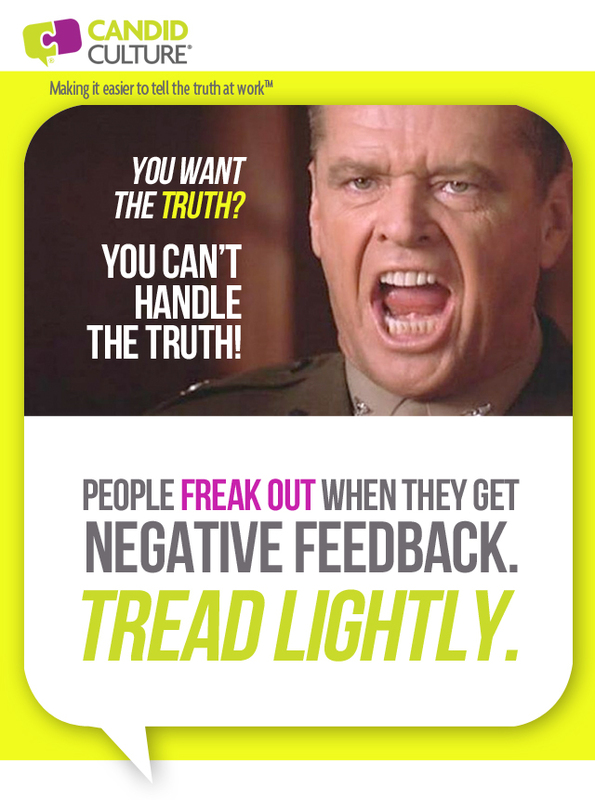 The normal, natural reaction to negative feedb ack is to become defensive, a response I’ve labeled as The Freak Out. Everyone, even the people you think do little work, wants to be seen as good – competent, hardworking, and adding value. When anyone calls our competence into question, we get defensive. Becoming defensive is an automatic response that we have to train out of ourselves. Until the people you work with train themselves not to become visibly defensive when receiving feedback, just expect it. And be happy when you get a defensive response. It means the person is breathing and cares enough about what you’re saying to get upset. While you can’t get rid of a defensive response to feedback, you can reduce it by following a few employee feedback practices. Practice these methods of giving feedback and your input will be heard and acted on, more often than not. 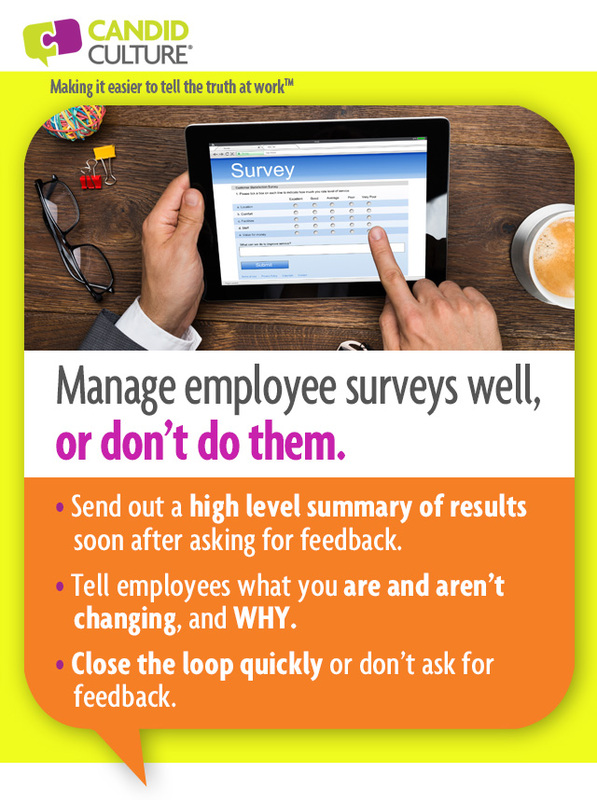 Employee feedback practice one: Don’t wait. Give feedback shortly after something happens. But do wait until you’re not upset. Practice the 24-hour guideline and the one week rule. If you’re upset, wait at least 24-hours to give feedback, but not longer than a week. If the feedback recipient can’t remember the situation you’re talking about, you waited too long to give feedback, and you will appear to be someone who holds a grudge. Employee feedback practice two: Be specific. Provide examples. If you don’t have an example, you’re not ready to give feedback. Employee feedback practice three: Praise in public. Criticize in private. Have all negative feedback discussions behind a closed door. Employee feedback practice four: Effective feedback discussions are a dialogue; both people talk. 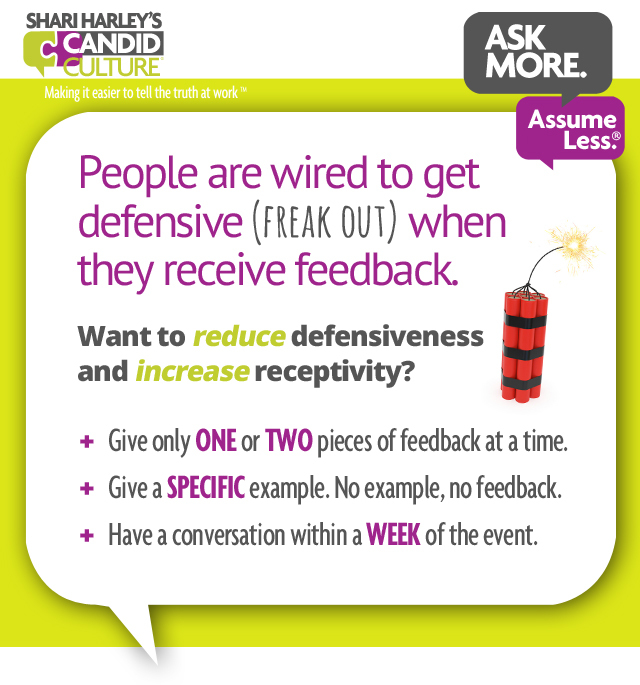 When the feedback recipient responds defensively, don’t be thwarted by his/her reaction. Listen to what s/he has to say and keep talking. Don’t get distracted. Employee feedback practice five: Give small amounts of feedback at a time – one or two strengths and areas for improvement during a conversation. People cannot focus on more than one or two things at a time. Employee feedback practice six: Give feedback on the recipient’s schedule and in his/her workspace, if s/he has a door. It will give the other person a sense of control and s/he will be more receptive. Employee feedback practice seven: Talk with people – either in person or via phone. Don’t send an email or voicemail. Email is for wimps and will only damage your relationships. Employee feedback practice eight: Prepare. Make notes of what you plan to say and practice out loud. Articulating a message and thinking about it in your head are not the same thing. Employee feedback practice nine: Avoid The Empathy Sandwich – positive feedback before and after negative feedback. Separate the delivery of positive and negative feedback, so your message is clear. Employee feedback practice ten: Offer an alternative. Suggest other ways to approach challenges. If people knew another way to do something, they would do it that way. You can deal with whatever reaction to negative feedback you get. The other person’s response will not kill you. It might make you uncomfortable, but that’s ok. You’ll survive. Try to practice the guidelines above, and if you don’t, and you ‘do it all wrong,’ at least you said something. Just opening your mouth is half the battle. When you come from a good place of truly wanting to make a difference for the other person, and you have both the trust and permission to give feedback, you really can’t go wrong. Lots of organizations do exit interviews after employees give notice. Exit interviews can be a source of helpful information. 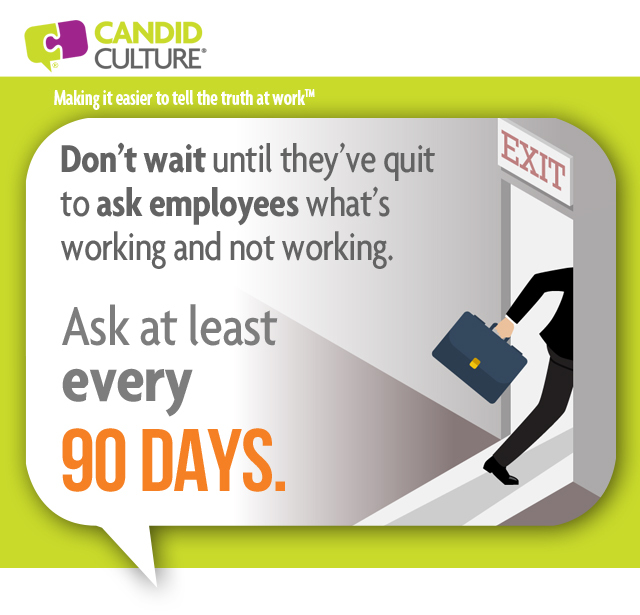 Employees have little to lose after they’ve quit, so they’re likely to speak candidly about their work experience. But asking for feedback after an employee has quit is a little (a lot) too late. The time to ask about an employee’s working experience is every 90 days, if not more frequently. Employees quit. It’s a natural part of doing business. And some turnover is healthy and helpful. Surprises, however, are not helpful and are unnecessary. Turnover should rarely, if ever, be a surprise. The writing is always on the wall, if you ask the right questions and make it easy to speak freely. Most employees are concerned about giving feedback when their input is negative. Employees at almost every company cite “a list,” and those who speak up, end up on it, and then mysteriously leave the organization. Mind you, no one has ever seen the list, but employees at all types of organizations are certain it exists. If you want to reduce the turnover in your organization and increase employee engagement and satisfaction, ask for feedback regularly, and make it easy to speak candidly. Manage your responses to feedback. The easier it is to tell you the truth, the more truth you’ll get. Employees are afraid of their manager’s reactions. Resist the urge to become defensive (which is very difficult to do). Saying, “I’m sorry that was your experience. Thank you for telling me,” goes a long way. Employees will breathe a sigh of relief and are more likely to speak candidly in the future. Replace one satisfaction survey with roundtable discussions during which a leader or manager asks a small group of employees for feedback. Live conversations build trust and loyalty. Written surveys do not. Help employees who aren’t a good fit, exit the organization. Don’t wait for poor performers or employees who aren’t a good culture fit to leave. Help misplaced employees find a better match. The right employees raise performance and morale, the wrong employees destroy both. Don’t be afraid to ask for feedback. Just because you asked for feedback, doesn’t mean you have to act on that information. Employees don’t typically expect all of their requests to be met. It’s often enough just to be able to speak and be heard. Keep doing exit interviews, and add quarterly or monthly requests for feedback. Talk with people over the phone or in person. Ask one or two simple questions to get the other person talking. Manage your face. Smile. Say “thank you” for the feedback. And watch your employee engagement and satisfaction rise. The normal, natural reaction to negative feedback is to become defensive, a response I’ve recently labeled as The Freak Out. How many times have you been sitting at your desk wondering, “Why won’t he ___________ ?’ Perplexed, you talk with your buddy at work. The conversation goes something like, “I’ve got this person, and I can’t figure out why he won’t ______________.” Or perhaps you talked directly to the person, but after several conversations, he still hasn’t done what you asked him to do. They don’t think they know how. Reason number one for a lack of employee performance, they don’t know how, is the easiest to solve. People who don’t know how to do something need training, coaching, a mentor, a job aid or some other form of instruction. The hope is that with the right training and exposure, he will be able to do what you’re asking. Reason number two for a lack of employee performance, they don’t think they know how, can be improved over time with patience and consistent coaching. You aren’t working with clean slates. Most people are recovering from or reacting to a past relationship or situation. If a person worked for a controlling manager who never let him make a decision or worked for someone who invoked punitive consequences for making mistakes, the person will be hesitant to make decisions. Hence why he does drive-bys on you, repeatedly checking in, but never pulling the trigger on anything. If you work with someone who doesn’t think he knows what to do, but you know that he has the answer, encourage him to trust himself. When he comes to you for validation or approval, ask questions, don’t give answers. Tell the person you trust his judgment and encourage risk taking. Tell him that you’ll support his decision, even if it proves to be the wrong one. And encourage him to make the decision next time without consulting you. And then keep your word. If he makes the wrong call, you have to have his back and can’t invoke negative consequences. Reason number three for a lack of employee performance, they can’t, is challenging but clear-cut. People who can’t do a task their brains aren’t wired for, will never do that responsibility well, regardless how much coaching, training, and assistance you provide. If you have repeatedly AND EFFECTIVELY, coached, trained, and provided support, remove that responsibility and give the person something he can do well. If that responsibility is a large part of the job, you have someone in the wrong job. It’s time to make a change. Reason number four for a lack of employee performance, they don’t want to, is annoying but manageable. There are lots of reasons people don’t do things they don’t want to do. Those reasons include, but aren’t limited to, boredom, lack of buy-in as to why something is important, insufficient time, feeling like a task is beneath them, etc. If you’ve got someone who can but doesn’t want to do something, you can either take the responsibility away, incent him to do it, or give feedback EVERY TIME the task doesn’t get done. Giving negative feedback isn’t fun for the giver or the receiver. No one wants to hear that he isn’t meeting expectations and most people don’t want to tell him. But the discomfort of receiving negative feedback EVERY TIME the person doesn’t do what he needs to do will create behavior change. He will either begin doing what you ask, quit, or ask for a transfer. Either way, your problem is solved. The first step in getting people to do what you want them to do is to discover why they’re not doing what you ask. It’s impossible to appropriately manage employee performance if you don’t know why someone isn’t doing what he needs to do. And the person to ask why a responsibility isn’t getting done isn’t you or your buddy, it’s the person not doing the work. So get out of your head, leave your office, and go talk to the person not doing the work. “I’ve noticed you’re not doing ___________. Help me understand what’s happening.” Watch your tone, inquire from a place of genuine curiosity, and identify the reason he isn’t doing what he needs to do. Then you can intervene appropriately and hopefully get what you want.